Working with teenagers brings up all the stuff you went through as a teenager. Stress, drama, growing pains, and acne. 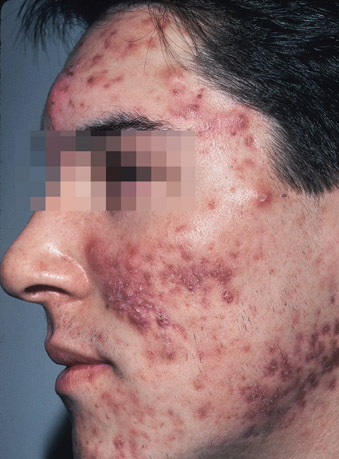 Some of the students have really severe acne, like in the picture above. With all the various treatments they have now a days, I'm surprised to see kids like this. Seriously. I see ads all the time for all kinds of acne treatment and then seeing kids like this in school it makes me wonder. I was lucky. I never had a big problem with acne, neither did my daughter. But some kids get it really bad and I feel sorry for them. I remember some of the pimples I would get and how they would hurt, I can only imagine how much that hurts. I know I would not want to live with that. I would scour the internet, use every one of the Murad Coupon Codes I could find, and try everything available until I got rid of this. Of course, people might be saying the same thing about me and my wrinkles. I don't wear make-up and I rarely use face cream. I have some wrinkles. Maybe I should look into getting some Resurgence for my wrinkles and aging skin. On second thought, my wrinkles are a kind of badge of honor and I think I'll keep them. At least for now. They probably are trying everything they can. I know I did, and nothing ever worked at all except accutane. People judge you for it, but there's really nothing they did to cause it, its all genetic.